In homage to my late late Le Cassoulet post, I thought I would take this opportunity to go back to the future and catch up on another meal worthy of a write up. The date is some time in early November 2009, the place, Bellevue Rendez-Vous. I have lots of sisters. In fact, I have them coming out of my ears and as they get older, birthdays appear to be getting more and more expensive. I swear their more exuberant requests for birthday presents are not proportional to my rather gradual increase in salary. Thankfully, my little sister is probably the least fussy of them all. I even remember fondly how one year, all she wanted for her birthday meal was not a slap up five course meal but a local takeaway kebab. 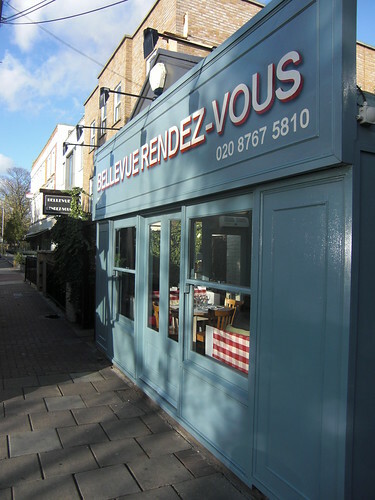 This year saw us head to Clapham and the aforementioned Bellevue Rendez-Vous. Located just round the corner from Chez Bruce and Brinkley's, it has some seriously fierce competition. Serving modern French food, it's not really reinventing the wheel, but it sticks to the basics and executes on these well with the occasional artistic squiggles and splodges. There are no airs and graces, with friendly service and informal decor. People drifted in and out with their obligatory pushchairs in tow (this area isn't known as the pram belt for nothing). The starter of smoked duck on a celeriac remoulade was incredibly moreish, but that could have had something to do with the fact that it was a minuscule portion. I simply wanted more. 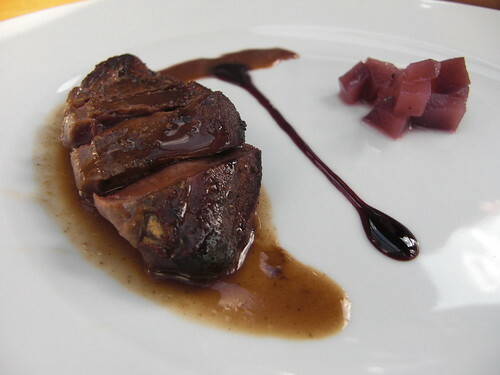 My mothers wood pigeon was perfectly executed, with a reassuring pink tinge to the flesh, still tender and juicy. The tiny stack of pear chutney was the perfect accompaniment, although I am unsure as to what the dark streak down the middle of the plate was nor why it was there. The mains were equally well executed. 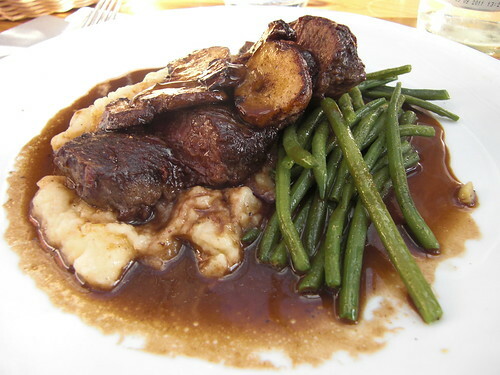 My roast venison had a slightly more rustic approach with everything slathered neatly onto my plate. Again, perfectly cooked meat and a really wholesome meal. Even though the presentation appeared more straightforward, the kitchen was still showing some invention with the introduction of the artichoke mash which was pleasant, if a little unusual. The confit leg of duck was also highly commendable. Although not my dish, the three portions ordered by separate members of my family meant that there was ample amounts of duck for me to scavenge. Crisp skin and moist flesh with bags of flavour, this also comes highly recommended. Fit to burst, desserts were almost overlooked but you don't become a Teh without culturing a fearsome ability to eat, so a few were ordered and shared out amongst us. 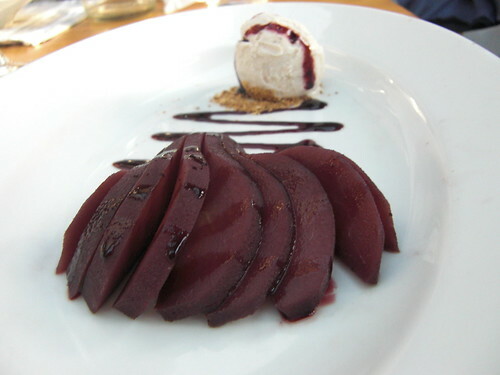 The poached pear was a triumph, simply poached in red wine, cinnamon and cloves to retain the flavours, gentle to the bite whilst not reduced to mush. This was accompanied by vanilla ice cream and the obligatory unnecessary squiggle. I know it's been ages since I went, but looking through my photos of this meal brought back fond memories. Although it is clearly competing with some serious competition, it is more than capable of holding its own. 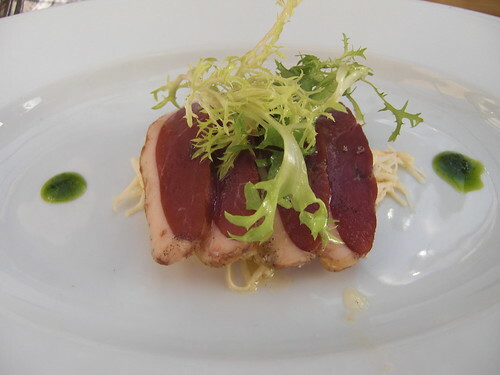 What you get is delicious, beautifully presented, well cooked dishes. You can't really ask for more than that, now, can you?